Political science has very few ‘laws’, perhaps explaining why the European discipline has so stubbornly clung onto its most famous product – Maurice Duverger’s claim that countries using ‘majoritarian’ voting systems will always have two party politics. This ‘Law’ has underpinned numerous completely ineffective efforts by European politicians in PR systems to create party consolidation by changing their voting laws. With European political scientists meeting this week in Berlin, Patrick Dunleavy explains why such ‘reforms’ have had zero success. Modern theory and better evidence now show that the alleged ‘Law’ has lost all credibility in FPTP countries – and works only in the USA. All elections (indeed all competitions) have a horse race element in which most attention from the media, elites and voters themselves tends to focus on the top two contenders, as much in proportional representations contests as in British-style voting systems (often called ‘first-past-the-post or FPTP systems). Yet the most famous ‘law’ in political science, coined by the Frenchman Maurice Duverger in the early 1950s, holds that the operations of first-past-the-post voting system with single-member districts directly and strongly tends to cause two party politics. So the USA, UK, India, Canada and other Westminster systems should all be two-party polities in this perspective, if not at the aggregate national level, at least at the level of contests in each local constituency. Modernized and made more operational by Gary Cox in an influential 1997 book, Making Votes Count, Duverger’s Law still has so many thousands of cites in the political science literature that no practicable citations count is really feasible. (Google Scholar yields over 37,000 references, and Google Books nearly 9,000 more, but both cover mostly since the mid-1990s). In Europe, the Law was energetically criticized by a few political scientists (notably Giovanni Sartori), but also endlessly taught and repeated to generations of politicians, especially on the right wing of politics. Many European elites have longed to consolidate party politics into simpler patterns than usually occur with proportional representation systems. So inspired by Duverger’s Law, many different reforms have been tried across Europe, designed to introduce ‘majoritarian’ elements and so capitalize on the anticipated consolidation of politics. These include de Gaulle’s re-founding of the Fifth Republic in 1958; the 1990s shift away from PR in Italy (pushed by Stefano Bartolini); various ‘reinforced majority’ provisions in Italy, used first for electing city councils and then scaled up by Berlusconi into a national fix in the noughties. Most recent has been a vote in the Romanian parliament to adopt full-blown FPTP. All these ‘constitutional engineering’ efforts have failed completely, with European voters stubbornly remaining multi-party in their afffiliations – for a very good reason. Even in its supposed heartlands, Duverger’s Law doesn’t work. Duverger claimed that his effect operated in two ways. First, politicians know that with UK- or US- style voting systems a party can only ever win a seat by coming top in a local election district (or constituency) – that is, by winning the largest pile of votes (a plurality), whether or not the party has a local majority. So if you are not going to be in the top two parties locally, why stand? 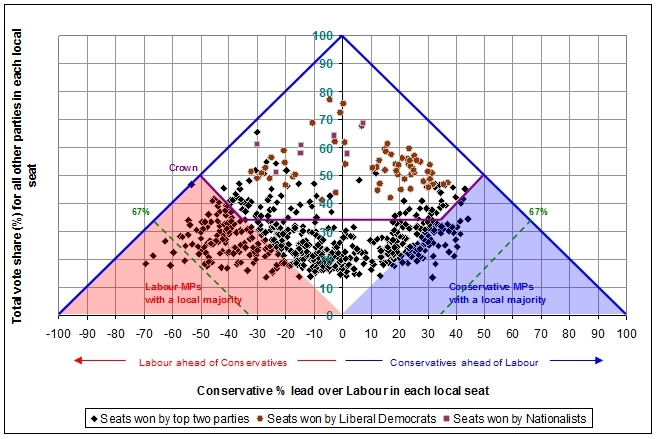 Nationally, what’s the point of coming second, third, or fourth in lots of seats without winning any – the traditional fate of liberals in the UK since the 1930s? As a result, third and fourth parties don’t stand, and if they do, they quickly die out. This logic still works in the USA, and my first chart shows how the resulting American party system looks. (This chart and both subsequent ones are drawn from joint work with Rekha Diwakar). 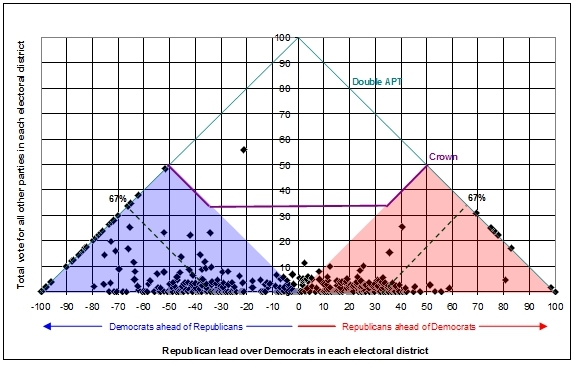 Going down to the level of 450 sears in the House of Representatives, the bottom axis shows seats where Republicans are in the lead on the right hand side of the chart, and seats where Democrats lead on the left-hand side. The vertical axis shows the combined proportion of votes in each locality backing third, fourth or fifth parties. But for now, as our continent’s leading political scientists gather at the European Political Science Association conference in Berlin, could we not just accept (at last!) that the ‘law’ is bust and cannot be revived or defended any further? Arguing this case with colleagues, I still feel like John Cleese in the famous Monty Python sketch, insisting on the completely, blindingly obvious. Duverger’s law is extinct. It has ceased to be. It is no more. This is a dead parrot. 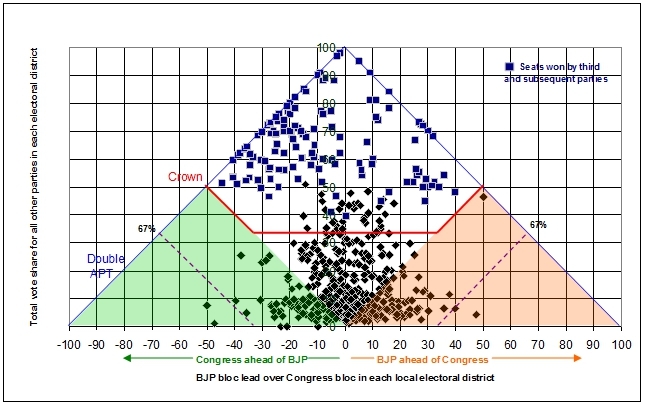 This blog draws on recently published research by Patrick Dunleavy and Rekha Diwakar, ‘Analysing Multi-party Competition in Plurality Rule Elections’, in the journal Party Politics. Sadly this is behind a paywall, but if you can’t get access please email Patrick. An earlier version of this post appeared on LSE’s British Politics and Policy blog. The programme for the European Political Science Association conference is online here. So if you would like to read some of the detailed research behind the argument above, please do have a look. To really explore your thesis, you should compare graphs in Scotland, where we have both the FPTP system and Proportional Representation. You could plot data from Westminster representation and compare with Holyrood representation and see what the pattern looked like then. Anecdotally, I would argue that PR in Holyrood has given much more of a multiplicity of representation from other parties, the SNP majority in the last Holyrood election was an outlier as most parliaments have had no one-party majority. But your analysis would show whether that is true or not. Is it not the case that there might have been a historical trend that was bucked in 2011 off the back of the big global recession – the effects of increasing gap between rich and poor due to neoliberal consensus in both main parties was what led to the hung parliament. Voters are disillusioned and increasingly disengaged and in 2011 lots of Labour voters exhibited a punitive action against Labour by voting Lib Dem or Tory instead. The pattern is about the increasing poverty caused by successive neoliberal policies, which is rising up to affect the middle classes as well as working classes. If you can analyse the comparison between party representation of Scottish MPs and MSPs, that would be very useful information to have, as it may be likely that Westminster is under increasing pressure to change to a PR system due to the constitutional reform process that is likely to unfold. In Scotland, the next Westminster and Holyrood elections are going to be very interesting, off the back of the social democratic agenda that swept through Scotland in the independence referendum. I predict an SNP landslide in Scotland and a call for proportional representation at Westminster. The effects of the social democratic uprising during the Scottish Referendum are now taking root elsewhere in the UK, if Labour are due to lose their Scottish MPs you can bet they’ll be looking to support Proportional Representation to secure enough seats to have any power in Westminster.